Started by tallpine - April 15, 2019, 8:22 a.m.
Are you sure you want to delete this post: July 2019 corn? By metmike - April 15, 2019, 12:42 p.m.
Are you sure you want to delete this post: Re: July 2019 corn? 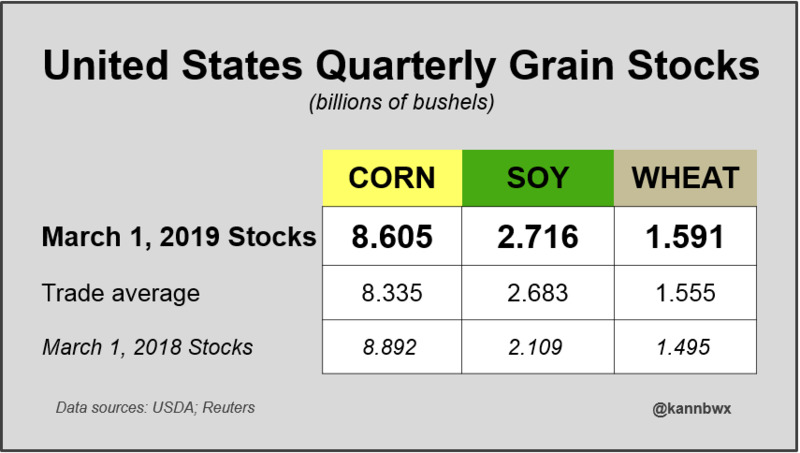 By metmike - April 15, 2019, 12:44 p.m.
Are you sure you want to delete this post: Re: Re: July 2019 corn? By metmike - April 15, 2019, 12:45 p.m. The corn market will be/is trading wet weather forecasts this Spring. Seasonals are positive and large funds have near record shorts on. There is still (almost) 2 months to plant the corn but the planting window should start opening up by early May or there will be some big fireworks with fund short covering. This operational GFS model product is updated every 12 hours. The GFS is updated every 6 hours. Are you sure you want to delete this post: Re: Re: Re: July 2019 corn? By metmike - April 15, 2019, 12:46 p.m. Grain stocks and planted acres for Corn were both extremely bearish on the USDA report at the end of last month. Are you sure you want to delete this post: Re: Re: Re: Re: July 2019 corn? By metmike - April 15, 2019, 12:48 p.m.
Go to this link, then scroll down a page to see the corn planting pace for 2013, which had the slowest planting pace at the end of April since records were kept. Just 5% of the corn crop was planted in 2013 on April 28th, which was tied with 1984 for the slowest pace ever at the end of April. This year, 2019 will be competing for the slowest planted crop ever here in the early parts of the planting season. 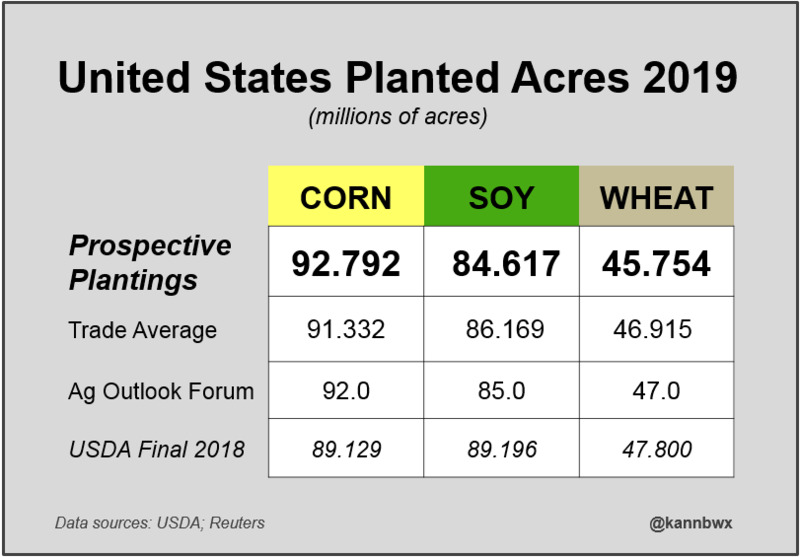 "The U.S. Agriculture Department said corn planting, as of April 28, was 5 percent complete, just 1 percentage point ahead of where farmers were a week ago. The pace was the slowest since 1984, when farmers also had completed just 5 percent of their corn planting. Analysts had predicted corn planting to be 9 percent finished, according to the average of 13 estimates in a Reuters poll that ranged from 7 to 11 percent. Prior to USDA’s planting report, corn traders on Monday had expected a slow planting place and bid Chicago corn futures 6 percent higher for their biggest gain since July. In Iowa, the top U.S. corn producing state, planting was just 2 percent complete. Farmers in Illinois and Indiana, two other major producers, had finished just 1 percent of their corn seeding. The five-year U.S. average for the end of April is 31 percent, while a year ago, farmers had finished 49 percent of their corn planting. Corn planting in 2012 was completed in record time but the final crop came in well below expectations due to the drought that hit the Midwest during the summer. “Our main concern is not that we didn’t get most of our crop planted by the end of April, it’s just we’re not quite sure when we’re going to start,” said Emerson Nafziger, agronomist at the University of Illinois. In 1984, the last time planting was as slow as it is now, the sluggish ace had little impact on harvest, with final corn yields averaging 32 percent better than the previous year." Will 2013 Be The Slowest Corn-Planting Year Ever? So is this the slowest ever(2013)? That depends on how you judge “slowest.” We’ve always shown 1993 as the slowest year, primarily because it got started so slowly, with less than 10% of acres planted by the end of April. Like this year, producers caught up some in mid-May 1993, planting 53% of the acres between May 5 and May 19 of that year. But there are a number of years that had a lower percentage of acres planted by week 21, which this year corresponds to May 26. Only 71% of acres were planted by this week in 1995, and only 78% were planted in 1996. Only 82% were planted by now in 2009. The national average yield in 1995 was 13.2 bu. below trend. For 1996, the yield got within 1.5 bu. of trend, while 2009 saw the current record corn yield of 164.7 bu./acre. That was 11.9 bu./acre above the 1960-present trend, and 8 bu./acre larger than the 1996-present “biotech era” trend. By metmike - April 15, 2019, 12:50 p.m.
By metmike - April 15, 2019, 12:01 a.m.
Corn tonight seems to be reacting positively to the wet forecast coming up as expected. If we stay wet for a few more weeks, we could have an explosive rally from big fund short covering. Still plenty of time to plant the crop but if we still only have national planting in the single digits in 2 weeks(which looks likely) and the forecast for 2 weeks then are still wet for especially IL and IA, suggesting not much planting until at least mid May, corn may be 20c higher than this. CK needs to clear the April 4th high of 3.66 1/4, then it's looking like a solid bottom is in................until the weather turns dry and the crop gets planted in timely fashion. Temps look warmer for the Midwest in the 2nd half of April which is more bearish than cold temps.However, too much rain will be increasing in bullishness for each day that goes by just as a new drier pattern showing up, that allows planting to catch up will quickly put the kibash on the rally. Planting delay rally's are often the trickiest to trade because they are not always taking yeild away and they mean that the soil moisture profile is chock full(too full) so it will take much longer for the market to initially rally on hot/dry weather. If its hot/dry in May, this will be seen as bearish(in 2012, with the crop planted and dry soils, hot and dry in May was mega bullish because the potential to kill the crop was there). This year, especially with a weak El Nino, the chances of a drought developing are very slim. Odds for something like 1993 are higher than average but still that only happens every few decades. However, with climate change, excessive rains are one of the few legit negative elements which threaten our crops that are higher. If models suddenly all turn drier overnight, corn can go lower too(the first week part of the operational GFS right now is actually drier). Are you sure you want to delete this post: Re: Re: Re: Re: Re: July 2019 corn? By metmike - April 15, 2019, 12:51 p.m.
Are you sure you want to delete this post: Re: Re: Re: Re: Re: Re: July 2019 corn? By metmike - April 15, 2019, 7 p.m.
Corn 3% planted vs 3% last year and the average of 5%. This had to have been expected. By metmike - April 17, 2019, 6:23 p.m. The extended, for the 3rd day in a row continues bearish with very warm and drier than forecasts previous to that. 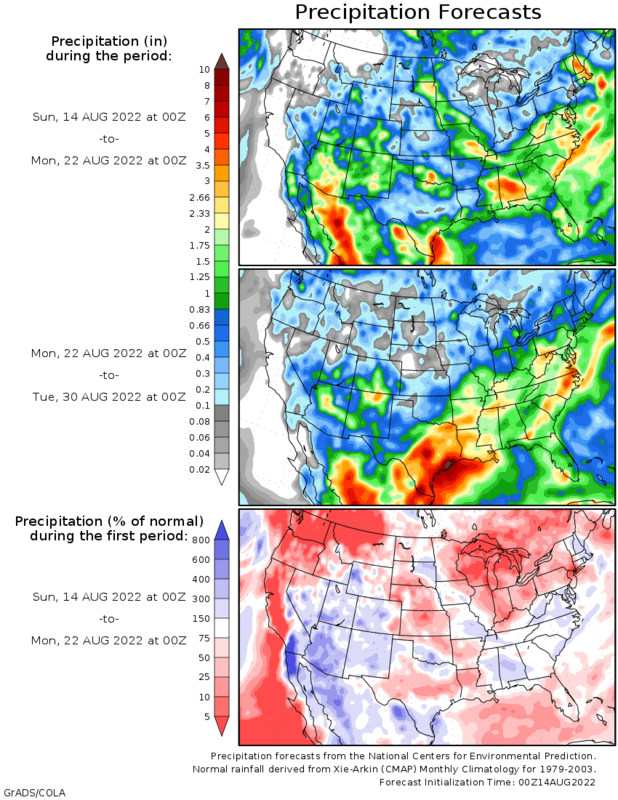 The NWS 6-10/8-14 seem too wet to me.